Egypt's President Abdel-Fattah El-Sisi has arrived at the Police Academy in New Cairo to attend a ceremony held by the Interior Ministry to celebrate National Police Day, which falls on 25 January. 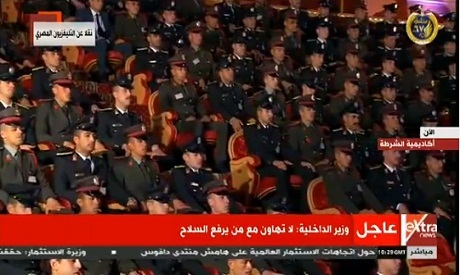 A number of senior officials and public figures, including Interior Minister Mahmoud Tawfik, attended the ceremony. National Police Day marks a battle fought by police forces in 1952 against British occupation forces in Ismailia City on the west bank of the Suez Canal. The British occupation, which ruled over Egypt from 1882 until 1956, had issued a warning to Egyptian forces to evacuate the area so they can take full control of the Canal, but police forces stood their ground. Dozens of police personnel were killed and over 80 were injured in the Ismailia battle.